See city center sights including two top sights in just a few hours. At the Acropolis of Athens, you’ll explore the graceful and enduring Parthenon which is one of the most famous archaeological sites in the world. Then, you’ll dive deeper into its worldly significance at the Acropolis Museum where marble masterpieces from the Acropolis tell a compelling story on their own. The tour starts at the Syntagma metro station for a brief look at the ancient artifacts displayed at the metro’s museum. 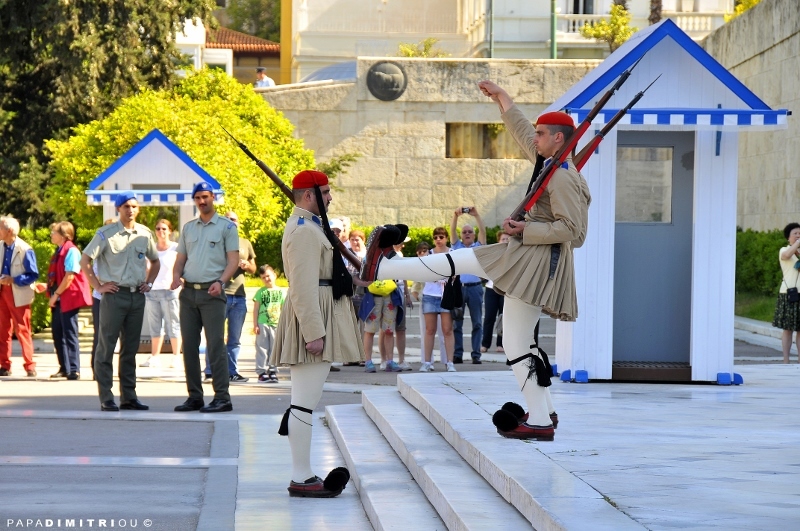 You’ll also see the Greek Parliament, the Monument of the Unknown Soldier, and watch the Changing of the Guards. Next, our guide will walk you through the National Gardens, Zappeion Hall, the Temple of Zeus and Hadrian’s Arch. From there you walk towards the Acropolis through the beautiful pedestrian walkway of Dionysiou Areopagitou. Entrance tickets are not included in the tour fee and the ticket costs will be owed to the tour guide before the tour begins. We save you time by buying entrance tickets in advance so you can skip the lines. This service is provided at no extra cost. Note that children under 18 years old have free admission to the Acropolis and all the archaeological sites. Entering on the south slope of the Acropolis, you’ll encounter the Dionysus Sanctuary and Dionysus Theater before you walk up the slope leading to the Acropolis monuments. Panoramic views of the city will be perfect for photos. NOTE: After the first part of the tour ends on the Acropolis at approximately 13:00 (1:00 pm), you may take more photos before meeting for the Acropolis Museum Tour. During this time, you may get a snack or a drink before the guided tour starts at the museum at approximately 13:45 (1:45 pm). There will be no time for a leisurely lunch. Designed by renowned Swiss architect Bernard Tschumi and notable Greek architect Michalis Photiadis, the Acropolis Museum captivates guests on approach. Its seamless modern lines elegantly incorporate artifacts exclusively from the Acropolis, and excavations are also visible under glass floors and walkways. The marbled surviving treasures are impressively displayed with the use of natural light, situated on a modernist open layout. Panoramic views top the experience. The tour ends at the Acropolis Museum at approximately 15:00 (3:00 pm). An Athens Walking Tour representative will be waiting for you at the cruise arrivals terminal holding an orange colored Athens Walking Tours sign. Your transfer will depart from the port at 8:45 am. Your driver will drop you off at the entrance of the Syntagma metro station in front of the Parliament building. Your Athens Walking Tours guide will be holding an orange Athens Walking Tours sign inside of the Syntagma metro station, one level down, by the ticket validating machines located underneath the big central hanging clock. Please be at the meeting point by 9:15 am. The tour starts at 9:30 am. Your transfer will depart at 15:50 (3:50 pm) from Patseas Jewelry Store, at the beginning of the pedestrian Dionysiou Areopagitou walkway, across Hadrian’s Arch. The guide will point out this meeting place earlier during the tour. The vehicle will have an orange colored Athens Walking Tours sign in the window. If for any reason you miss the return transfer, you will have to return to the Port of Piraeus by your own means. Important Note: You must be at the designated meeting point 10 minutes prior to departure. The departure vehicle stops briefly to pick up passengers and will depart immediately for the Port of Piraeus. *On Good Friday (Greek Orthodox Easter) our tour starts at 10:30 am inside the Syntagma metro station.